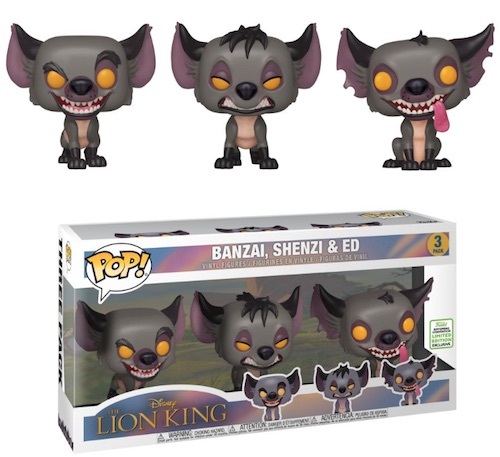 Funko released a vast majority of their Emerald City Comic Con 2019 exclusive Pop figures including the Lion King Hyena Funko Pop Figures, a couple of days back. And well, not-so-surprisingly, one of these few exclusives that made through the night comes via Amazon. While this article was being written, you may order the Disney Lion King Hyenas 3-Pack here, with its shipping being slated for 5th April. Their Overwatch Sombra exclusive of Emerald City Comic Con is also available here, with the same date of shipping. Both these Funko exclusives are backed up by Amazon’s pre-order guarantee, so you will not be charged with anything until they ship and you get the discounts that come in between the time of your order and release date. We will not expecting a lot of discount of these figures soon, but we do expect a sell out on the cards. If you want to check on any other Emerald City Comic Con Funko exclusives’ availability, come over to the master list provided via Comicbook.com. If you’re going through this after March 15, we can let you know some interesting things are also coming that you wouldn’t want to miss. The first one comes from the Funko Shop at 7 AM PST. Chances are that the exclusives by Funko shop will probably sell out in seconds. However, you may have a fair shot at getting the DC Super Heroes Mister Mxyzptlk figure at EE (Entertainment Earth) when it comes out on 9 AM PST. This figure is one of our favourites to come out of Funko’s lineup at ECCC this year, so they should cherish it while they can. In case you’ve missed out on any Pop Figures, you may always get your hands on them on eBay.